Since establishing La Contessa in 1986, artisan Mary DeMarco has stayed true to her passion of creating aesthetically imaginative jewelry and gifts. Mary’s love of antique jewelry, vintage furnishings, and decorative objects is reflected in the artfully, handcrafted pieces she designs for her La Contessa line. Charming, unique, and whimsical are just a few characteristics that describe the bracelets, earrings, necklaces as well as the ornamental gifts that comprise the collections. Mary has always been fascinated by nature and finds inspiration from many sources: from traveling abroad, to visiting museums, to gardening, to cooking, to taking hikes, to walking along the seashore. The brilliant and lush colors identified with nature’s creatures and their habitats are embraced in her creations. “In nature, the colors are bold and striking, yet delicate. “My artistic voice and my work are truly enlivened by my surroundings,” says Mary. Mary believes her artistic calling comes to her honestly from her grandfather, who was a jeweler and watchmaker in East Baltimore during the city’s booming commercial and industrial eras of the 1930s, ’40s, and ’50s. The names of La Contessa’s collections, such as Floribunda, Primavera, Fiori di Bosco, and Il Mare, pay homage to her Italian-American heritage. Each La Contessa object is completely handcrafted in the studio. First, a model is sculpted and then casted in lead-free pewter. Individual components are then soldered and finished to create a multilayered, antique or vintage appearance. For the decorative touch, semiprecious stones are mixed with Austrian crystals to create a vibrant design. Much attention is paid to detail—turn a piece over and you’ll find a bee, a bird, or a flower; or perhaps a pair of hands or a bird in a nest are set as a closure on a necklace. These original features distinguish La Contessa in the marketplace, and many customers consider the jewelry timeless collectibles. These colorful earrings are on an euro wire, set in antique silver and made with american lead-free pewter. The earrings are 1 1/4" long and 3/4" wide. 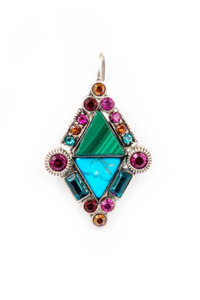 NK-9830 is accented with red and turquoise hand-painted enamel with mohave gren turquoise, red adn turquoise cabochons and carnelian, red and turquoise semi-precious stones. 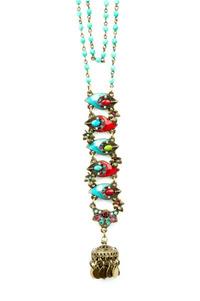 Chain is 30" long and feather and jhumka drops are 5" long and 1" wide. 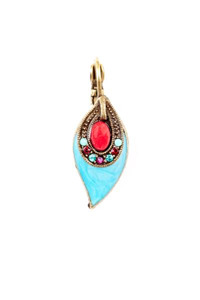 The Proud as a Peacock feather on eurowire earring is accented with turquoise and red semi-precious stones and turquoise and is hand enameled. The earrings are 1" long and 1/2 " wide and set in antique gold and made with American lead-free pewter.